The votes are in! The ballots have been counted! Both of them, mine and Dork Emeritus Morgan's! And I am pleased to announce that WE HAVE A DORK! Vice-Dork Emeritus Rebel earned notice from Morgan for doing homework, and dorky homework at that, on her birthday. And those of you who actually really wanted to enter, but didn't because you didn't feel like you could deal with the disappointment of not being found dorky enough: That was extremely dorky! You should be proud of yourselves. Don't think I don't know who you are. In an unprecidented move, after hours of agonized soul-searching, it has been decided to SPLIT THE VICE-DORKSHIP. The Vice-Dork of the Southern Division is: Chuckdaddy. Morgan expressed satisfaction with "a narrative of striving to be dorky enough to win Dorkfest," and "the insinuation that neither Fantasy Football nor sending odd emails to class instructors were dorky." Both Morgan and I have a soft spot for bracket enthusiasts, and it is fair to say that the whole idea of having a tournament of art probably would never had occured to me without Chuckdaddy's influence. For me, the cherry on the top of Chuckdaddy's candidacy came in the Cézanne v. Chagall contest, when a man with no known special pre-IAT interest in art appreciation used the phrase "Chagall, he's just so.... dreamy." The Vice-Dork of the Northern Division is: Mm Mud. Mm's entry is so dorky that I didn't fully comprehend it the first two times I read it. At length, I realized that it is either a parody of previous successful Dorkfest entries, or a methodical attempt to derive a new successful entry based on careful study of Dorkfest history, or both. It is also quite self-referential, which is very dorky. She was also not afraid to lie about her esoteric interests in order to win the day, which impressed both judges. Also, she read all the words in the application. An important question! 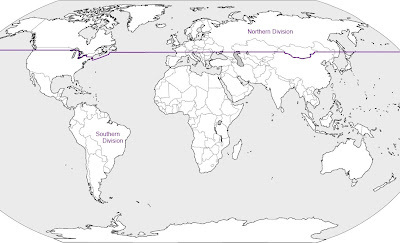 The Northern Division shall consist of all areas north of 47 degrees north latitude, except in Central Asia, where the entire country of Mongolia is included therein, and in eastern North America. There, from where the U.S./Canadian border crosses 47 degrees N in Lake Superior, the demarcation will follow the international border, continuing through Lake Erie to the Pennsylvania/New York state line. 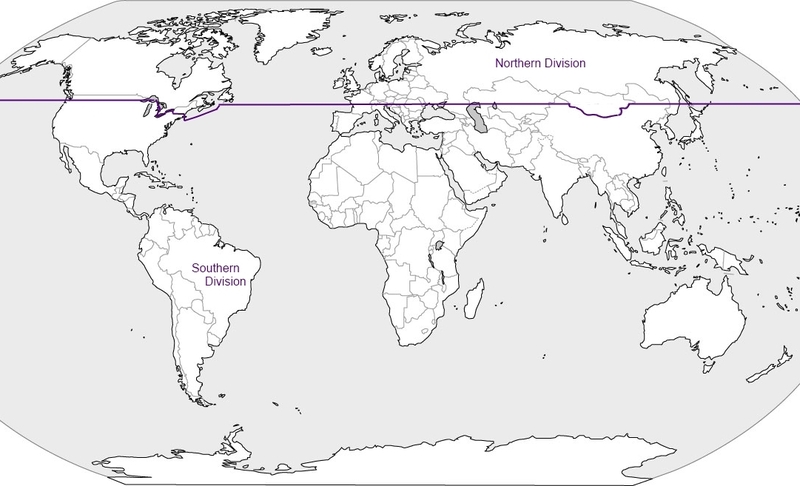 Thence it shall follow the straight northern border of Pennsylvania, continuing in a direct line to the northern border of Connecticut and Rhode Island. All of Canada as well as Vermont, New Hampshire, Maine, and Massachusetts are in the Northern Division, as is upstate New York north of, say, Red Hook. The Southern Division is everything else. In addition to their jurisdictional responsibilities, Southern Vice-Dork Chuckdaddy will have the additional privilege and responsibility of pestering me about any little detail about the Tournament that isn't quite right. Northern Vice-Dork Mm Mud may proactively carve out an area of equivalent responsibility -- choosing the Saints of the Month, as a hypothetical example -- if she so chooses. Annuntio vobis gaudium magnum! Habemus Dorkam! Nichim started very strong, I felt, with the five words "Ima do a cv, but...." Says Morgan: Some dorky bits that I particularly enjoyed were her use of Doctor Who for her website assignment, her correcting her instructor's broken links and outdated content, and her use of the phrase "They Might Be Giants" anywhere in the CV. Other pluses were her euphonium playing (I imagine that [Michael5000] will also give extra points for this) and the fact that she took each of the offered theoretical linguistics courses. The cherry on the top is that she even has a dorky career in Linguistics! Overall an excellent submission. Yes, Morgan and I both found a cherry on top. What of it? Nichim's dork curriculum vitae, which I feel speaks for itself, is posted for your perusal. I am not that dorky. I thought I was kicking it off with an American-style haiku, but I just re-counted. Guess not. Now I need to re-start my blog so I have somewhere to put my special badge. I get a special badge, right? This should have been a campaign promise, but I guess I didn't need it: I promise to write a victory song and distribute it on my National Solo Album Month album. Yes, I think we made the right choice. Congratulations to our new Dork, our new Vice-Dorks, and to anyone dorky enough to have read this far. Special props to anybody who clicked on the maps to study them in more detail. I doff my cap to our dorky victors! That is one impressive CV, Nichim. (I am so glad I put off reading it until it could properly intrude on my workday.) It is a testimony to the breadth and depth of your dorkitude that your fungal interests were not presented as pivotal credentials, but merely an afterthought--a mysterious and delicate growth on the icing of a very impressive cake, if you will. Speechless! Songless! I always knew that if I tried hard enough they'd make a category to fit me! I have felt so validated in my dorkishness since my virtual inauguration, in which I took my oath of office over the Great Tzotzil Dictionary of Santo Domingo Zinacantan. As Dork I heartily recommend to you this tome, or at least the PDF, and specifically the Introduction, and the front matter generally. It's a treasure of linguistic and lexicographic dorkery and should be enjoyed by all of us. Very pleased! But one question- Why does SHE get Mongolia? Chuck: It compensates her for you getting all of Uruguay. *gasp* i was SO CLOSE and i never knew! i was going to be offended at nichim's speech but then realized zie was right. all hail the new dorks! 1) I believe Richard Deacon is British. 2)Why does the left round go 1st round elimination, 2nd round, then 2nd round elimination? I'm sure there's a perfectly dorky reason for this. Still, I am going to propose a controversial name change to 1st round, 2nd, round, and 3rd round- followed by 4th round. First round left bracket draws from the first round right bracket. Those winners go in to second round left bracket, which then feeds into second-round elimination, which draws from second round right bracket. It's to keep the rounds in sync between the two sides. Although I have complained to Michael5000 about the use of the word "elimination" to differentiate the different stages of the round because, really, don't both stages result in an elimination? To which he had no answer except for "to confuse everyone just that little bit further". Congrats to Nichim! It is a dubious honor indeed! Enjoy it. 1) Yes, corrected, thank you. 2) Morgan has the mechanism right, but he's lying like a snake with that quotation. I live to clarify bracket mechanisms. So yes, any time there's a contest in the left bracket, one artist will be eliminated. But in terms of the tournament as a whole, the elimination rounds are the ones that involve elimination. After First Round Elimination, for instance, we've got 128 artists in the Left Bracket (LB). The LB Second Round games pose these 128 against the 128 who lost in the RB Second Round, and that leaves... 128 artists in the LB. In Second Round Elimination, those 128 artists square off, and that leaves only 64. In the Third Round, those 64 take on the 64 losers of the Right Bracket Third Round, and we end up with 64 artists still in the LB. Third Round Elimination brings it down to 32. Suddenly, now that I have this Awesome Dork Hat, I understand everything M5000 says about brackets!